Once inside the 4,600-square-foot U- shaped home, the two split off to take the tour. By the time they met in the middle, they shared their surprising feedback. 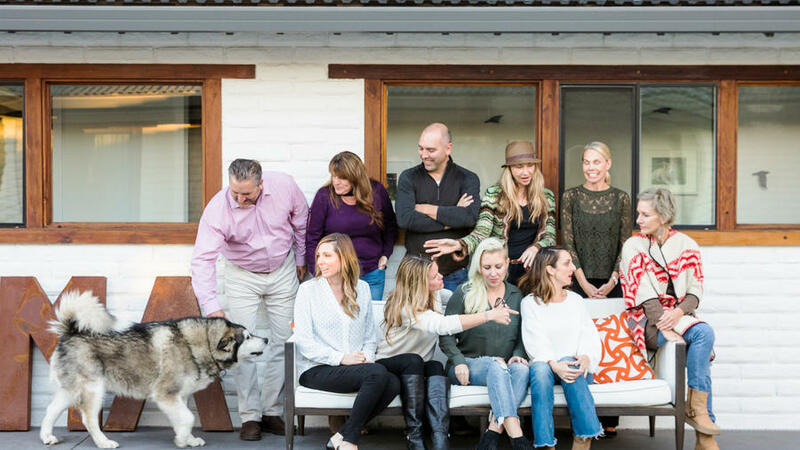 “We’d fallen in love with the house and knew we had to buy it,” says Porter. 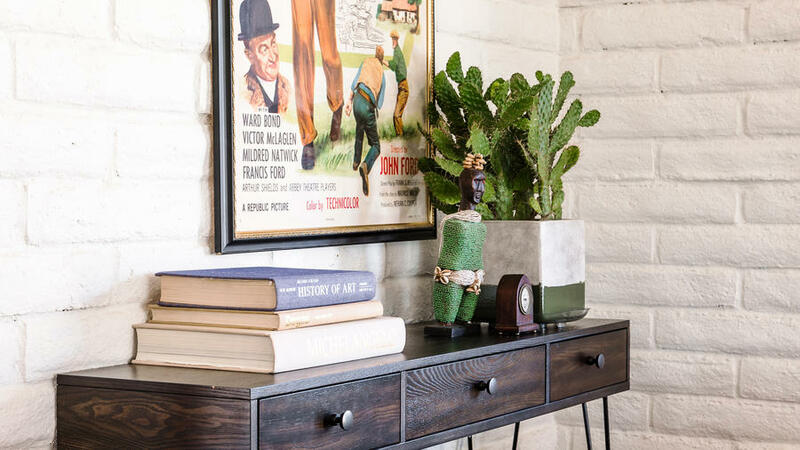 For all that drew them to the 5 1/2-acre property, the couple’s relentless careers in sales and marketing kept them from tackling a list of improvement projects. “It became frustrating to know what I wanted this house to be, yet unable to make any progress,” she says. 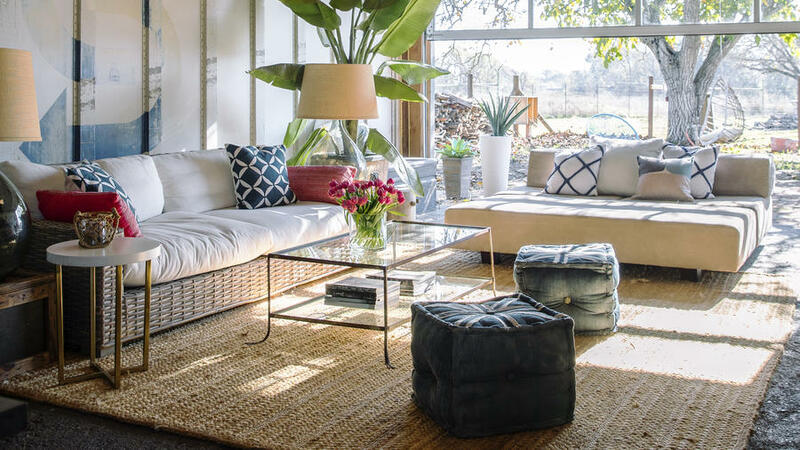 Then a visit to a Napa design showcase inspired Porter to pursue a similar idea for their home—that is, to assemble a whole group of designers to work on the rooms. 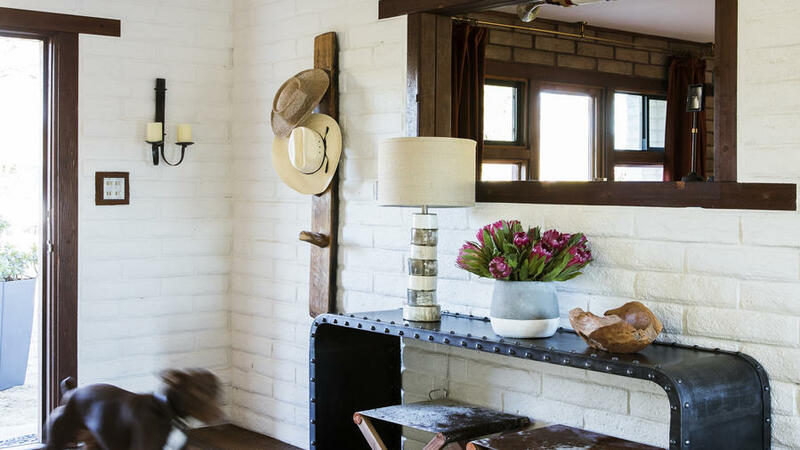 Within months, a team of 10 descended upon the ranch, bringing to life the narrative-rich spaces the couple envisioned based on their travels. 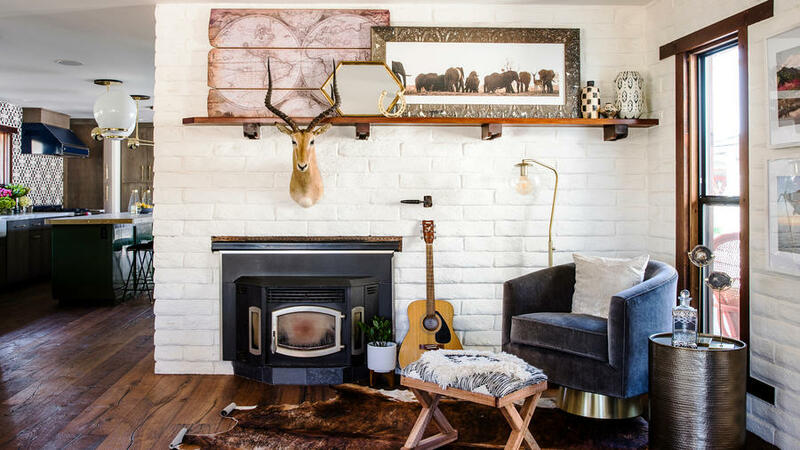 Named for the South African national park, this hideaway channels the couple’s adventures through tone-on-tone contrasts. 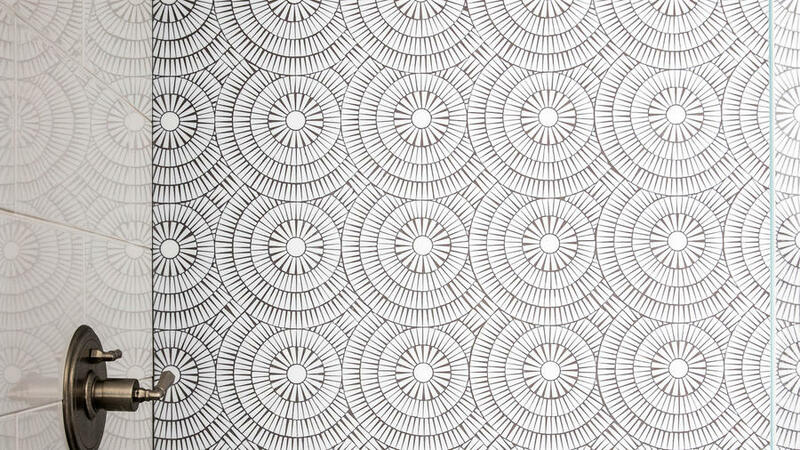 The printed grasscloth wallpaper sets the mood for the space, creating a backdrop for the gauze-sheathed canopy bed anchored on each side by accordion pendant lights. 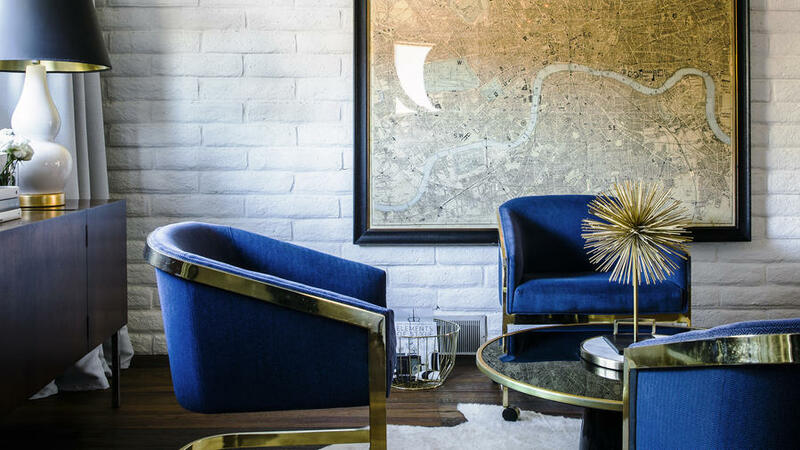 This British-style posh-meets-spice suite was inspired by a charity-auction trip the couple took to London with the San Francisco 49ers. 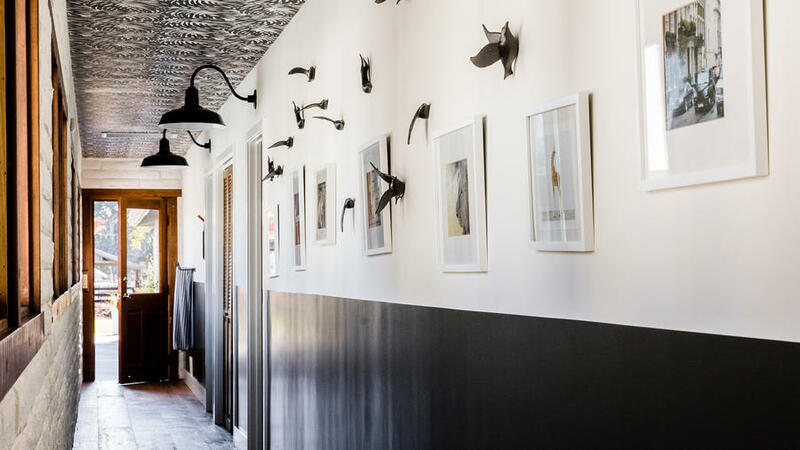 To emulate a cosmopolitan hotel, the designer softened the space by draping a brick wall and its windows, then painting the exposed sand- hued brick white. 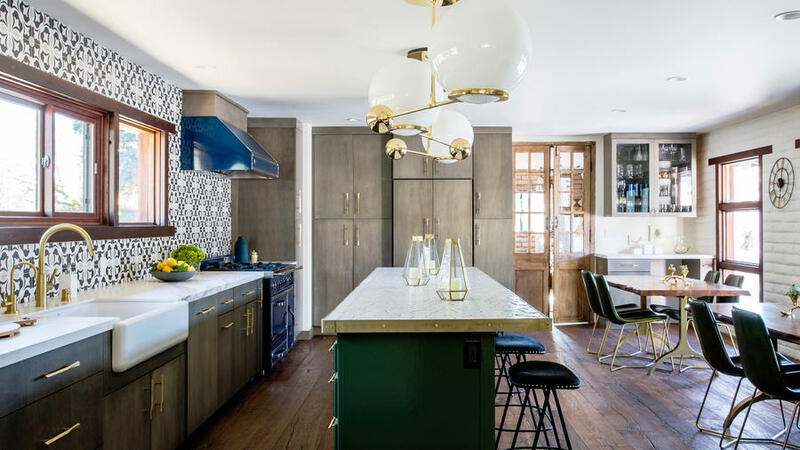 A set of statement-making swank vintage velvet-and-brass chairs takes center stage, while a cowhide rug provides earthy juxtaposition. 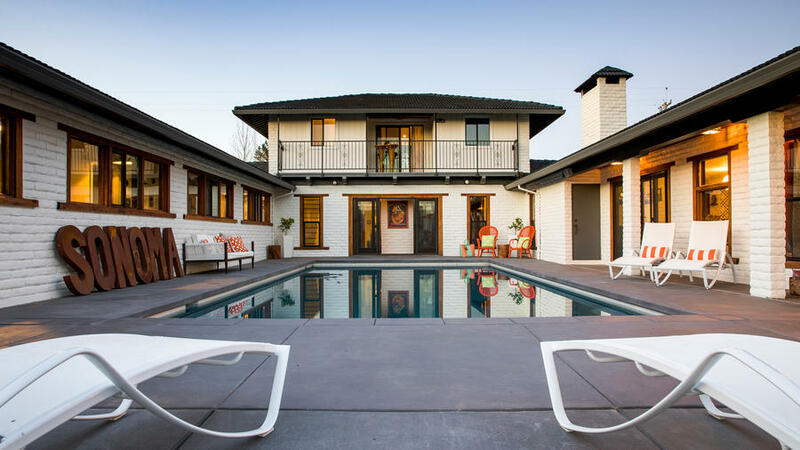 The generously sized bar and courtyard pool often lure guests outdoors. 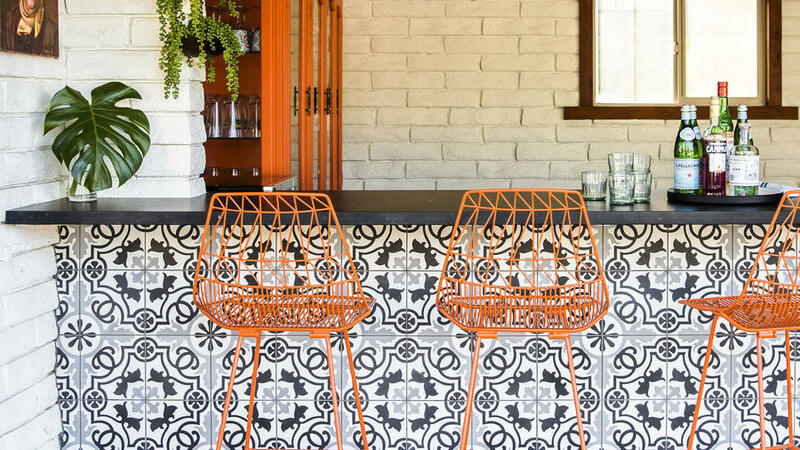 Pops of bright orange against black-and-gray encaustic tiles reflect the owners’ fondness for SoCal’s classic desert colony. 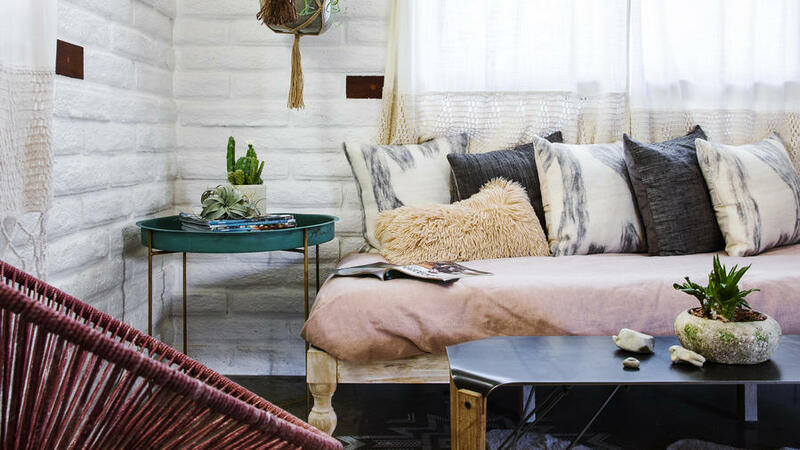 This retreat taps into a seductive south-of-the-border vibe with a nap-ready daybed and ombré mural. 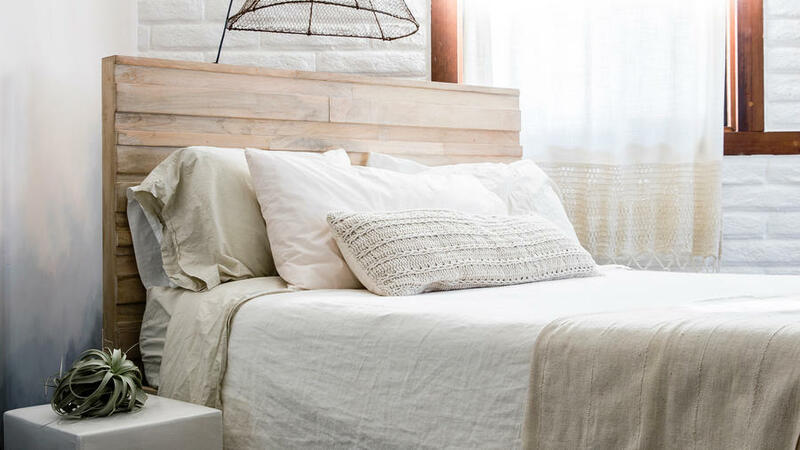 The poured-concrete floors are softened by crochet-hemmed curtains and macramé hanging planters. Industrial meets idyllic in a pair of affixed shipping containers set behind the main house and surrounded by wild grass and a herd of grazing sheep. 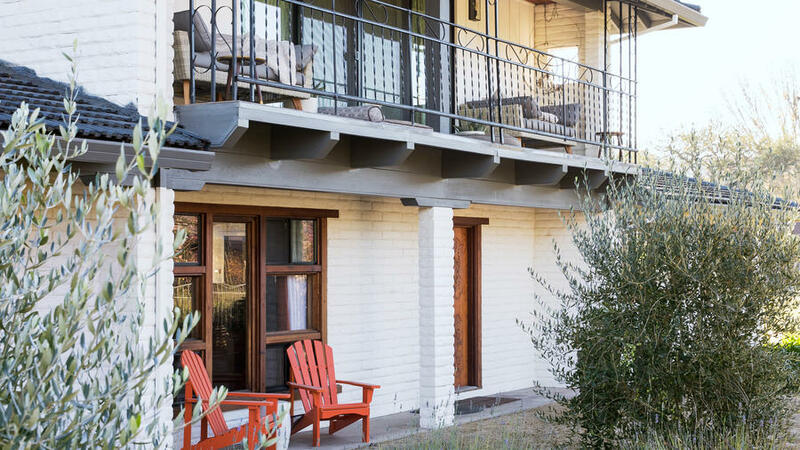 The structure’s good bones—from the wood beams to the rough concrete floors and original graphics—evoke an eclectic country atmosphere and help emphasize the indoor-outdoor connection, particularly when the clear glass door is left open. 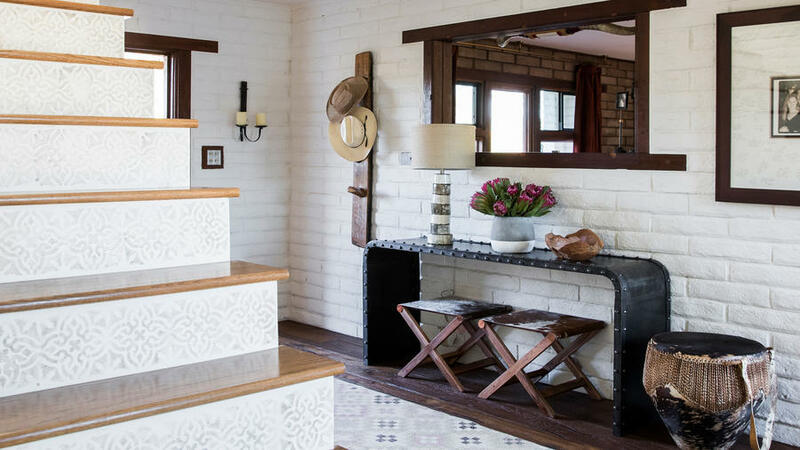 From the industrial studded console to the soft cowhide stools, the juxtaposed elements in the main entryway into the house were inspired by Boquete, Panama. Curator Hide Stool-Table, $249; cb2.com. 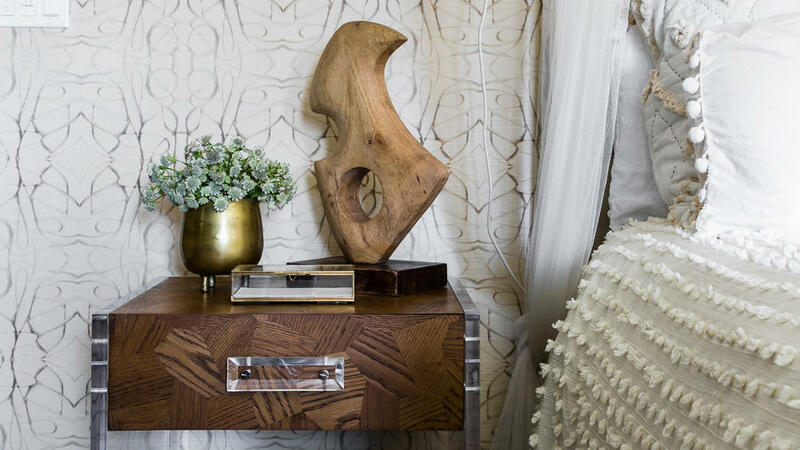 Stacked Horn Table Lamp, $850, themine.com. Leading to the wing of guest bedrooms the hallway got a surprising shakeup via wallpapered ceilings. The far end features a wall of hooks, perfect for those coming or going to pool just beyond the door. 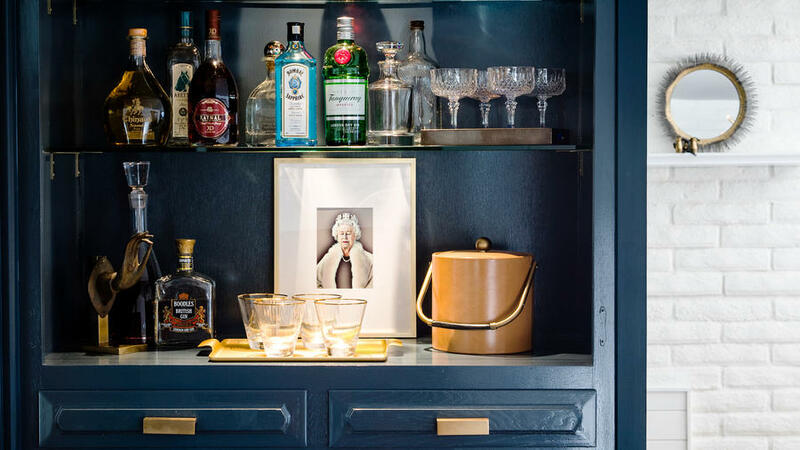 In the Grosvenor bedroom, Ann Wilhelm transformed a built-in dresser adjacent to the sitting area into statement making bar with a deep blue, high gloss coat of paint and a portrait of Queen Elizabeth. 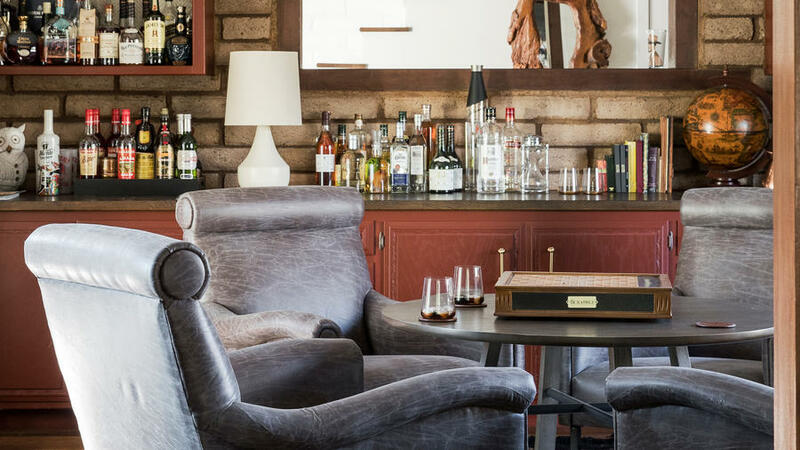 A shipping container behind the bar serves as the couple’s shared office space but felt dark and uninspiring. 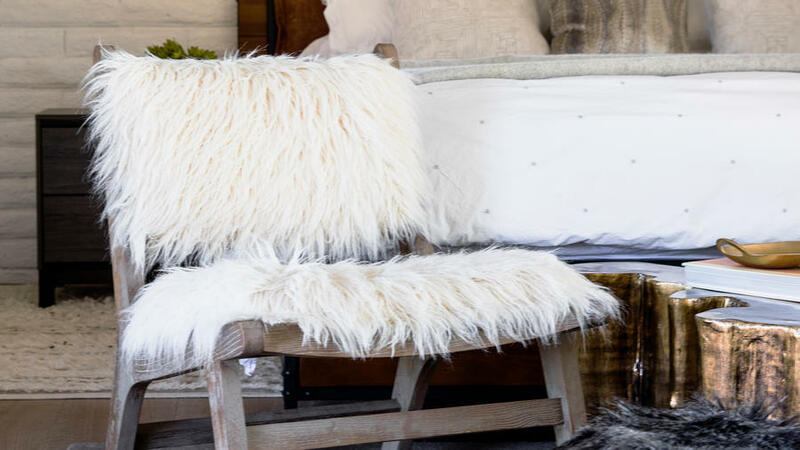 To add some much-need light, designer Kati Kelly (k. kelly Interior Design, kkellydesigns.com) painted the walls white and inserted a sliding glass door at south end facing the open field where the sheep graze. Then she designed an asymmetrical deck to wrap around the backside of the container, tacking on an additional 145 square feet of space. Inside, Kelly stuck with the character of the container including the beam-like roof panels, metal hangers, and un-sanded floor boards. 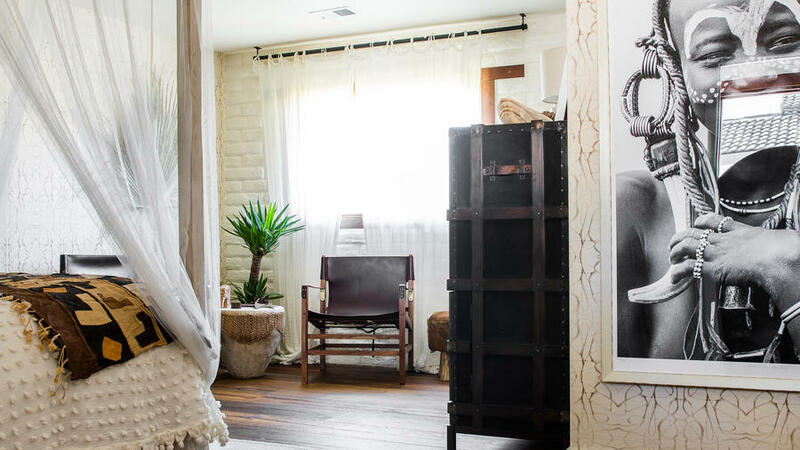 Noting Martin’s love of John Wayne, Kelly added some rural touches to offset the industrial nature of the container and its furnishings with neutral colors as well as brass finishes, cowhide chair, and geometric wallpaper. 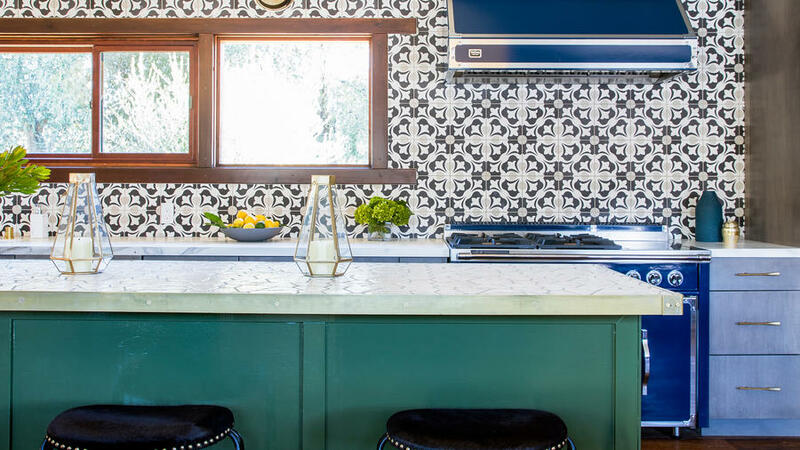 Lisa Arrowood commissioned local artist Jennifer LaPierre Gigi to stencil the new wood stairs to echo the graphic wallpaper and geometric tiles used by the other designers across the property. 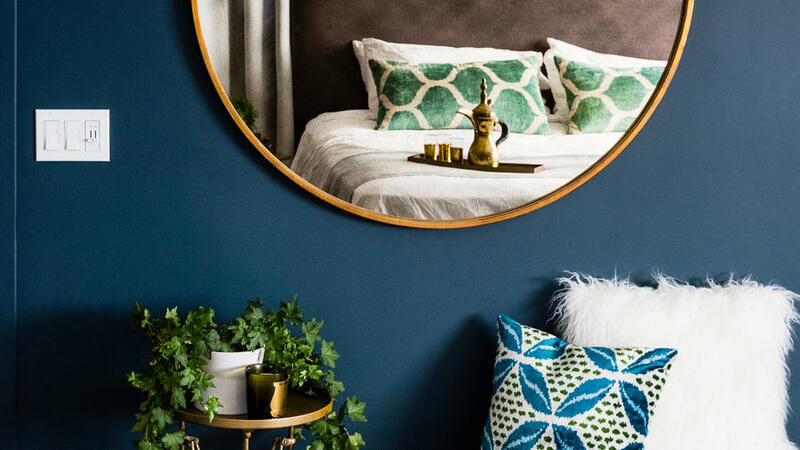 Across from the king-size bed in the Grosvenor bedroom, a brass and charcoal gray bench paired with a faux fur pillow and brass mirror make for a chic little respite. 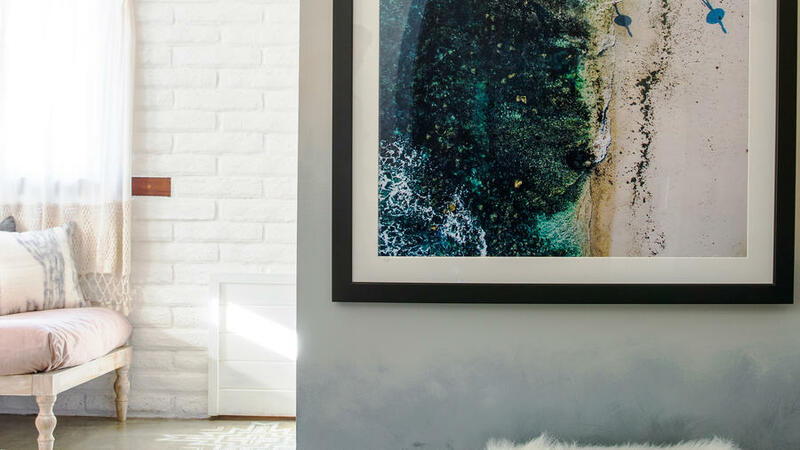 Picking up on the colors in the Sayulita bedroom, the entry was treated to a stunning ombré mural in deep blues to soft grays and a sunset-esque pink. 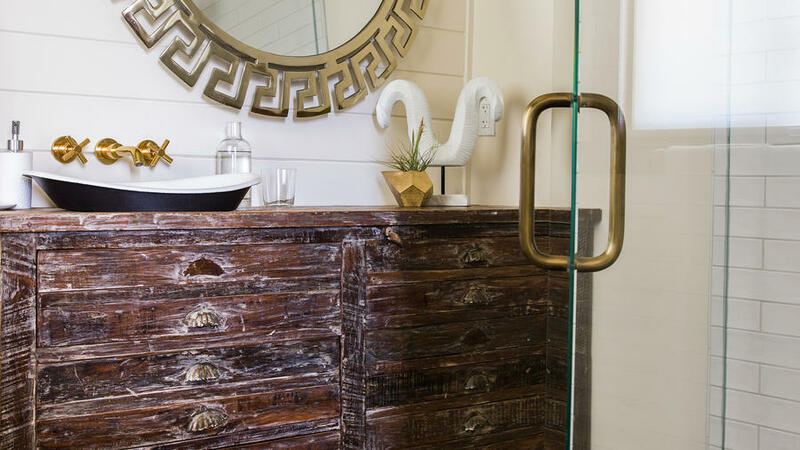 “I wanted to keep a soulful color story going into this room and chose to paint the entire room a jewel-colored green,” says Ann Wilhem of the Grosvenor bathroom. 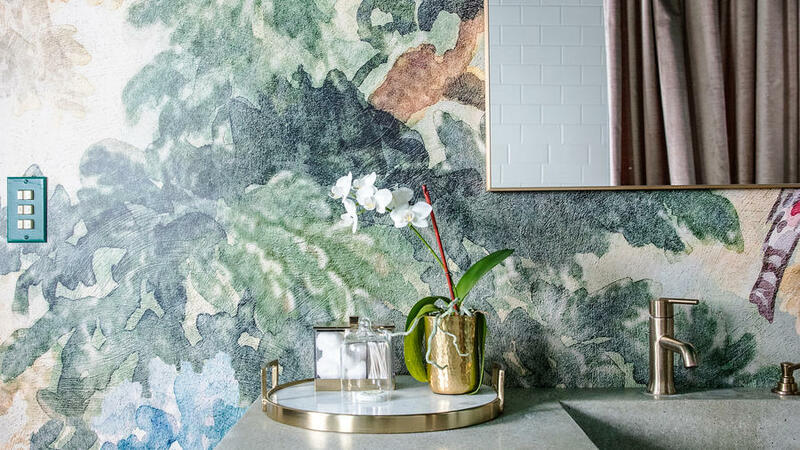 Then to break up the green and add contrast along the vanity wall she chose a bird and nature-infused wallpaper. 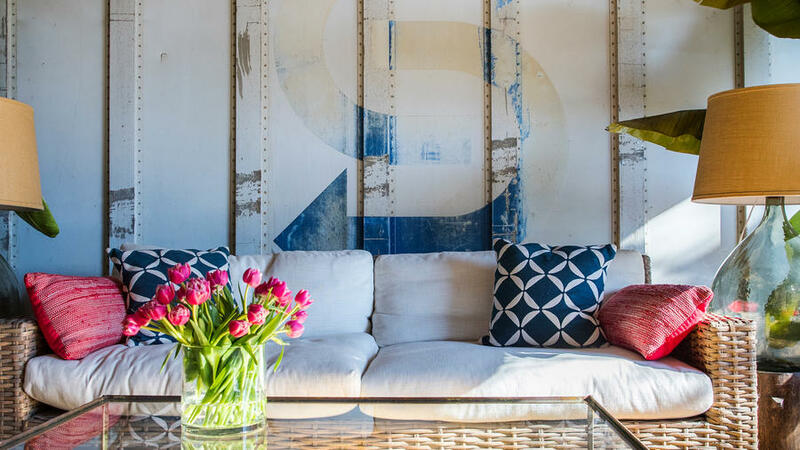 To make better use of this elongated space, Lisa Arrowood (arrowooddesign.com) reduced the length by creating a wall for the television closer to the bed, making room for a second walk-in closet and a larger master bathroom. To offset the busy nature of the first floor, she chose a neutral, natural scheme for the couple’s retreat. Custom artwork by Jennifer LaPierre Gigi; jenniferlapierre.com. Ivory faux flokati gunner chair, $288; worldmarket.com. Giza teardrop pendant, $229; cb2.com. Resin coffee table, $1600; livejuniper.com. 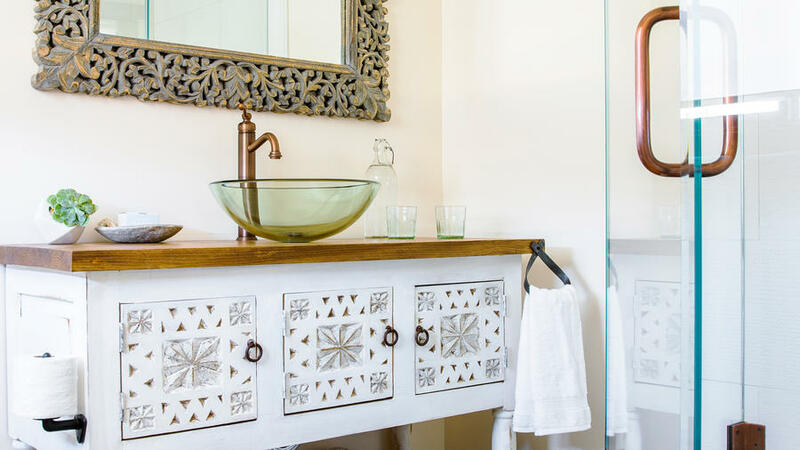 Playing off the casual vibe, the Sayulita bathroom features a modern on a traditional Mexican-style bathroom, a white wood carved vanity paired with an intricately design wood mirror. The pool, the bar and the weather often bring the party outside. 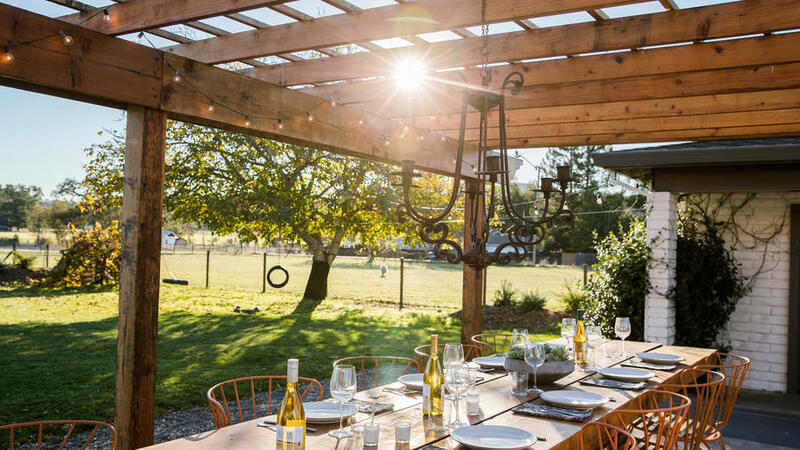 That’s why a roomy farmhouse table is a regular fixture outside, fitted with a candle-lit iron chandelier and plenty of globes lights so the night never has to end.